It's Facebook Fridays! for March 2, 2018, and we are here to help you learn the ancient art of bone reading and get in touch with the potent magical power of the American Raccoon! The Lucky Mojo Curio Company is holding a random drawing to give away 4 fabulous spiritual supply prizes that will open the door to divinatory insights. 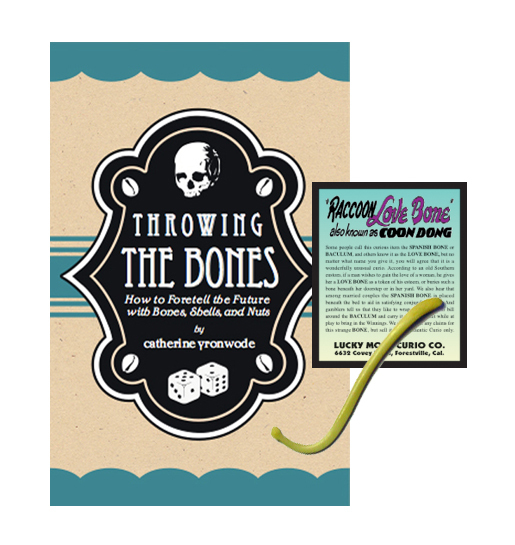 This week each lucky winner will receive a copy of Catherine Yronwode's mighty tome, "Throwing The Bones," along with a genuine Raccoon Love Bone or Baculum, which is used in bone reading and is also a popular hoodoo curio charm for luck in love and gambling. All you have to do to enter our weekly drawing is to scroll down and post a comment to this Facebook Fridays! status message. First thing tomorrow morning, we will select FOUR winners at random, announce their names here, and ask them to message this Facebook Page with their mailing addresses, so we can send them their FREE Bone Reading products. I hope y'all are jumping over to Facebook and entering these contests! this one runs until Saturday mid-morning, March 3rd, 2018. We have a winner! In fact, we have 4 lucky winners! Our Facebook Fridays! winners for March 2, 2018 are: Williams Theophany, Champagne Hughes, Chassidy Reid, and Jenny Rosa.